Beautiful is the strength it takes to reach for your dreams, to speak a little louder, to stand up for what you believe in and to not apologize for it. And that’s what Pantene wants to recognize and celebrate! #ShineStrong is an exciting movement designed to empower women around the world to be strong and shine, on the inside and out. It celebrates women just like you—who are confidently and courageously bringing this essence to life and inspiring other women every day to do the same. As part of this movement, Pantene has started #ShineStrong Tag to encourage women to give a shout out to the people, events and products that help them #ShineStrong via YouTube, Instagram (@PanteneHair), Twitter (@Pantene) and Facebook (Facebook.com/PanteneNA)! Here are the #ShineStrong Tag Questions, with my answers! 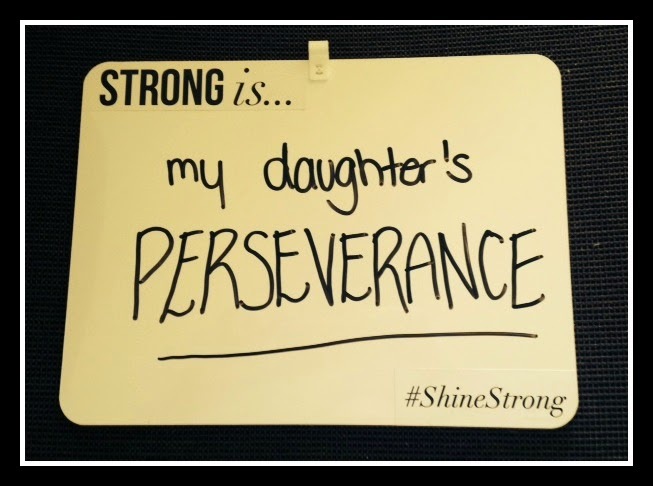 Strong is my daughter's perseverance. She will try so many times, so many different ways, to accomplish something. 2. What’s the bravest thing you’ve ever done? The bravest thing I've ever done is become a Mom. It's the best thing I've ever done too. 3. What do you do to unwind? I like to cuddle with my daughter and discuss her day. 4. What’s one thing you’ve always wanted to learn? To scuba dive! I've gone snorkelling and loved it, can only imagine what it would be like to stay under water for longer periods of time. 5. How does your #bff #ShineStrong? My #bff always looks on the bright side of things, especially in situations where it's hard for me to. I hope I do the same for her! 6. What natural talent would you want to be gifted with? Mathematic brilliance! Numbers and I haven't gotten along for a long time...and they are so essential! 7. What is your idea of happiness? Being at the cottage with my family. I stole this from Muno on Yo Gabba Gabba. "Think Happy Thoughts, Happy Thoughts" it gets me through a lot of different situations - from bad drivers to dealing with toddler tantrums! 9. 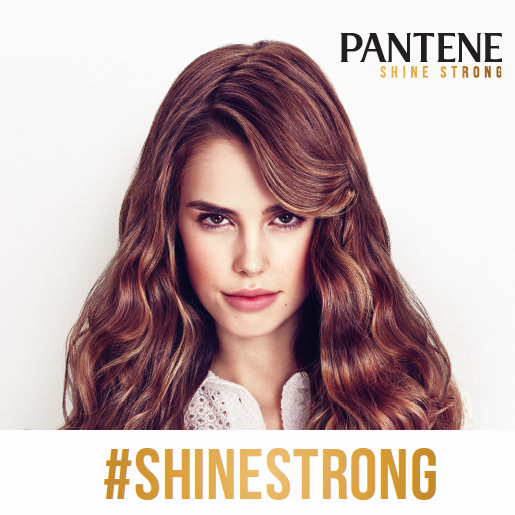 What is your ultimate #ShineStrong hairstyle? Wearing my hair down, with a side part. I love good hair days because that's when I feel most polished. 11. Share your best tip for strong, healthy hair. Always protect your hair before you blow dry. I love Pantene's Heat Protection Spray. I use it each and every time I blow dry, and always get shiny, smooth results! I #ShineStrong when I'm being Mom. An assortment of Pantene products, including shampoo, conditioner etc. To enter to win a kit, please leave a link to your #ShineStrong share in the comments of this post. On August 18th, 2014 I will choose three winners using Random.org, who will have 48 hours to respond in order to win. By entering the following contest you are accepting that if you win your contact information will be shared with a P&G PR and shipping agency for the purpose of mailing your prize. Please allow 4-6 weeks from the contest closure date to receive your prize. This giveaway may appear on other blogs as part of the #PGmom/#mamanPG program. However, to be fair, you can only win once per giveaway. If your name is chosen more than once, another winner will be selected. All winners must be from within Canada. © 2014 YYZ Bambina. All Rights Reserved. Here's my link to their FB page and my #ShineStrong comment, I hope this is right! Should we answer them all? © 2012-2018 YYZ Bambina. All Rights Reserved. Ethereal theme. Powered by Blogger.